The Marine Corps has provided two water purification units for use in the Philippines as the military there assists with relief efforts following an earthquake that left more than 140 people dead. 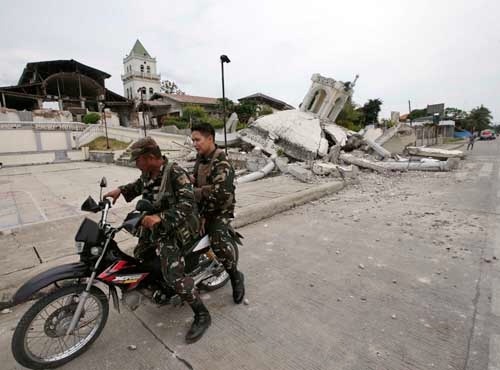 A 7.2 magnitude earthquake struck Bohol Island in the central Philippines on Tuesday. Buildings and roads have been destroyed, and the death toll has reached 144. The Armed Forces of the Philippines requested two water purification units the Marine Corps has staged there, said Chuck Little, a spokesman for Marine Corps Forces Pacific. The request came from the Assistant J7 of the Armed Forces of the Philippines. The units will be transported and operated by Filipino troops as they help provide disaster relief, he said. MARFORPAC has equipment like the water purification units pre-positioned in the Philippines as part of a long-term operational assessment, Little said. The Filipino troops will provide the command with feedback on the functionality of the water purification units in a real-world contingency, he added. This is the third time these water purification units have been used in contingency response since being pre-positioned in the Philippines, Little said. They were most recently used after a deadly typhoon pummeled the country in December, killing more than 1,000 people.